On July 12th, the West Central Florida MPO Chairs Coordinating Committee prioritized a list of regional multi-use trails. 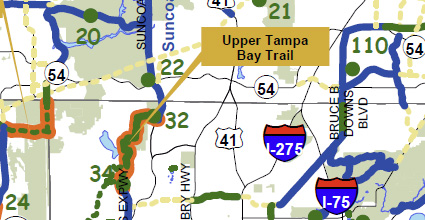 Their top priority is a long-awaited segment of the Upper Tampa Bay Trail. Known as Phase IV, the seven-mile stretch would finish the trail from Peterson Rd. to the North Suncoast Trail on Lutz-Lake Fern Rd. The cost of the project is estimated at $11 million. The Chairs Coordinating Committee (CCC) represents the Metropolitan Planning Organizations in Citrus, Hernando, Hillsborough, Manatee Pasco, Polk, Pinellas, and Sarasota counties. A newcomer on the list, the George Road Trail Connector, was also approved by the CCC as a regional priority. The Connector is envisioned as a link between the Courtney Campbell Trail and the Town ‘n’ Country Greenway. From there, cyclists and walkers could easily get to the Upper Tampa Bay Trail. The MPO is conducting a trail feasibility study for this corridor, and a cost estimate is not available yet. For more information, see the Multi-Use Trails Regional Priorities map or contact Michele Ogilvie at 813/273-3774 x317.